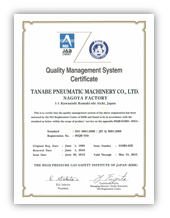 Company Name TANABE PNEUMATIC MACHINERY CO., LTD. Since founded in 1921, we have devoted ourselves intently in manufacturing Compressors. It is easy to say, that we make contributions in every aspect of society. However, we aim to be an eco-friendly company by holding high technology and advancement in the field of development, design, and manufacture with the motto "from the deep sea to the universe", and also serve our customers, vendors, and employees with their best interest at heart through product excellence. With the slogan of QCD:Q(Quality)C(Cost or Price)D(Date of delivery/Date of agreemen)+S(Service), all employees will keep challenging the difficult work and the task of new creation and development, in order to achieve our objective mentioned above. 1.1 Our aim is to be an enterprise like a brilliant gem by providing the customer satisfying products, that is, to serve the society by providing efficient, safe and reliable products. 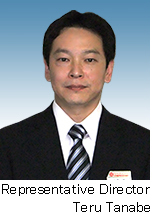 To achieve this objective, we will continually improve the effectiveness of QMS (Quality Management System) and meet the trust of our customers. 1.2 All employees will at all times tackle the task of securing and improving the quality of all products and aspects of our operations including marketing, research and development, planning and developing the products, supply, manufacture, distribution, sales, and service.